I just returned from another study visit to Sera Jey Monastery in Bylakuppe, India. We are studying the effects of monastic debate and analytical meditation on emotion and cognition. Since this was already the fourth visit of the project, it was time to get real and get down on scientific rigour. In our EEG study, instead of just exploring different types of debate, we now developed a procedure in which each pair of debaters debated the same topic (a text on bodhicitta), got some chance to refresh their memory before the debate by studying the text for 15 minutes, and we used a standard classification for the triggers that the observing monks were using to score the debate. We even asked our observers to give the debates a grade, so we can in the future see whether the quality of the debate is related to some patterns of brain activity. In addition, the most interesting new feature of our EEG studies was more related to the frequent power outages: we bought a big car battery to run our EEG system off of! 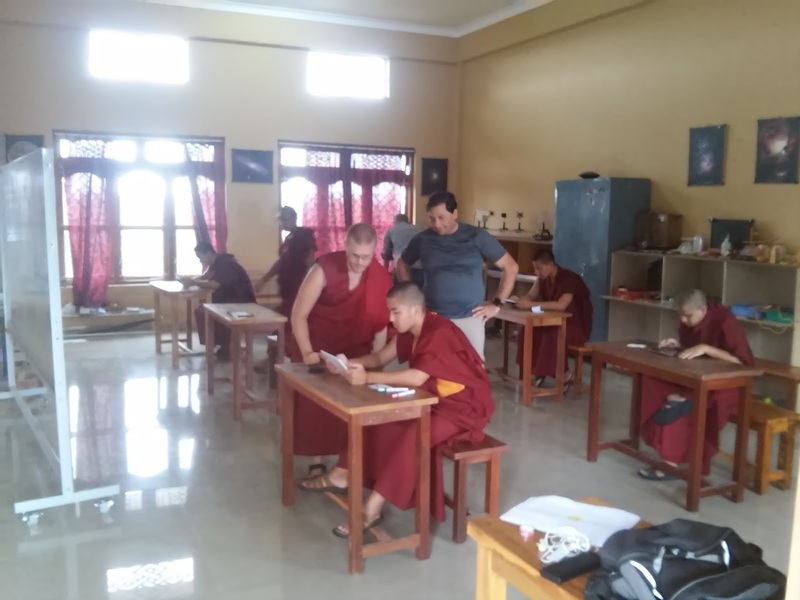 We also took major strides in standardizing the behavioral tasks that we have been running by filming one of the monks explaining it while demonstrating on a tablet, and then showing this same video to all of our participants. The video demonstrations nicely combine standardization of explanation with a hands-on demonstration. In addition to spending time on standardizing experiments, we also spent quite a bit of time making predictions with the monks. This was a significant challenge, because obviously monks do not have the same space of possibilities in their heads that we Western scientists do (e.g., things either differ in their magnitude or there is a linear or non-linear relation between them). The monks found it a challenge to make predictions--maybe because guessing is not really encouraged in monastic debate you are drilled to be absolutely certain of what you are talking about (and in predictions you can never be). Nevertheless, we managed to get some predictions, and at least some of the EEG predictions were actually borne out! This is always a major happy moment for a scientist. Of course predictions are not always borne out, and we are also still sorting through a lot of confusing data that we still have to make sense of. Actually, the hard part of doing psychological science is that when you present a person with a task, quite often do they behave in quite a different way than we expected. This is mostly because the tasks we use to learn about the mind are really mostly geared towards Western college students (see this paper for a great discussion of that issue). As we slowly see all these interpretations of the tasks happen, we develop more appropriate instructions, and hopefully in the future also new tasks that are made more for our target population. As a first step in preparing for this, we held a methods and statistics class, which was actually met with tremendous enthusiasm: almost the whole monastic core team showed up voluntarily for this class on their free day! We had a lot of fun talking about t-tests, anovas and different kinds of variables, and we even played around with Bayes Factors in JASP! This trip also was one of lots and lots of discussions. Actually one of the things that became obvious to me this time around is that the most insightful discussions actually happen when you are working one-on-one, not when having a large group discussion. For example, I spent a good amount of time sitting with my monk-colleagues to translate the debates (well, they translated, I wrote down the translations). In the course of this process I learnt a lot of tricks that happen while debating, such as interpreting a question differently when you do not know the answer to this question. This time we also met for the first time some Western monks studying at Sera Jey. Both with them, and with some members of our monastic collaborator team who studied in the West, I had some really interesting conversations about how monastic university training differs from Western university training. One thing that differs is the extent to which it actually informs how one practises and lives one's life. In addition, the debate training is a tool that is very confrontational: if you do not know something in great detail then there is no place to hide. This has as a result that you learn to really understand things in depth, but probably also that you build up quite an emotional resilience to being continually challenged. In short, it was a very illuminating visit, and such a precious chance to get to hang out in the peaceful monastery environment and the amazing group of monastic collaborators! Last but not least: our study was featured in the Times of India!